Islandport Press, the publisher of this book, classifies N is for New Hampshire as “Children’s Nonfiction,” and while that’s not untrue, the book is so much more. Scott Snyder is a New England photographer, resident in southern New Hampshire and a member of the New England Photography Guild, and his magnificent work graces every page of this lovely book. There are dramatic shots such as this one of the Mt. Washington Cog Railway on the cover, landscapes, interiors and exteriors, people shots — you name it. In a fairly short amount of time Scott has succeeded in mastering just about every kind of photography you can think of. Except the soullessly trendy. He has too much depth to his personality, too much sensitivity to the transcendent, to want to bother with that. Among the plethora of “souvenir” picture books that can be bought at Visitors’ Centers and book shops all over the Granite State, N is for New Hampshire stands out for the photographer’s avoidance of cliche and his deeply personal approach, and because Islandport’s production staff has done a superb job of reproducing the photographs in natural colors and not in souped-up oversaturated versions that some book and calendar publishers seem to think the public wants. While Rebecca Rule’s text is straightforward enough for children to be able to read and appreciate, it’s by no means too elementary to be informative for adults as well. 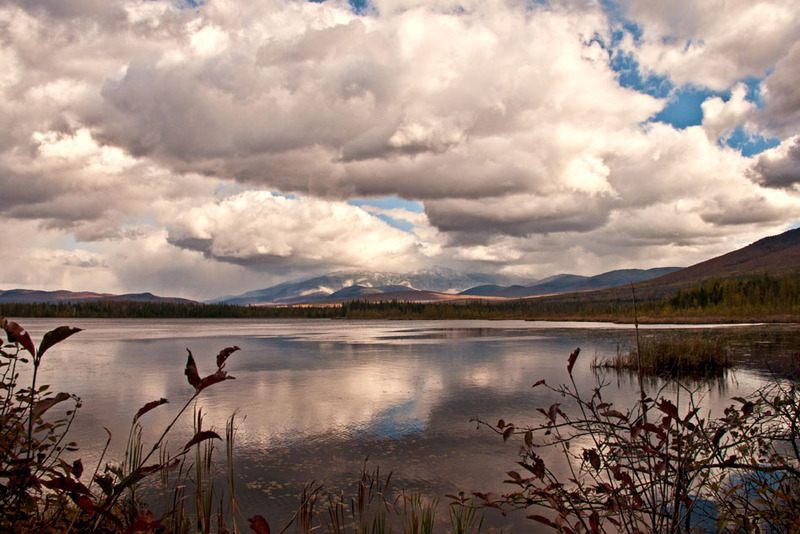 N is for New Hampshire is an enchanting book for all ages. It’s an unsurpassed way to become acquainted with the work of one of New England’s truly outstanding photographers. You can see more of Scott’s work by visiting his website, and you can purchase his book by clicking here or visiting the website of Islandport Press. Have you ever ventured out, armed not only with your camera but also with some preconceived notions of the images you want to make? It happens to me on week-long visits to New England as well as on half- or full-day trips closer to home. And does it then also sometimes happen that you end up with images radically different from what you thought you were setting out to take — perhaps because the lighting wasn’t what you expected or that tree wasn’t there anymore or etc., etc., etc.? Sometimes that’s a fun part of the game. And then there are times I go out with no specific ideas for images but just respond to what’s around me. Again, I like the element of surprise. Here I want to share two images from my recent trip to the northern New England coast, both of places I’d been and things I’d photographed before. Each had its own unique element of surprise. The Sunday I decided to drive along the Maine coast toward Ogunquit was sunny and quite windy. After stopping along the coastal road (Rt 1A) to photograph buildings that took my fancy, I ended up, as I knew I would, at the famous Nubble Light. Nubble is probably the most photographed lighthouse in the USA (if not possibly the world, though I wonder whether Peggy’s Cove in Nova Scotia might be a competitor) because it’s so accessible — you just walk up to it. No boats, no sneaking onto private property, no long hikes on soft sand — just drive up, park, and get out your gear. As you well know, ease of access doesn’t guarantee ease of getting a great photograph. For one thing, it was midday, usually not the optimum time to chalk up any photographic masterpieces. Also, on a Sunday afternoon in early spring chances are quite good of getting people wandering into your otherwise perfect composition. Photoshop processing, after my usual preliminary moves with the Raw file in Lightroom, was relatively minimal. I took the image into Nik Viveza, moderately cranked up the Brightness and Structure, and brushed these settings onto the lighthouse and the foreground rocks to make them stand out from the blue water and sky. Back in Photoshop, a very slight degree of opening the shadows in the Shadows and Highlights. And there you have it: my surprise that any of the images taken under less than optimum conditions would be successful. The second one contained a surprise of a different kind. This is a well-known tree on the New Hampshire coast at Great Island Common (a.k.a. New Castle Common) near Portsmouth. I first shot it a year ago while out with New England photographer Jeff Sinon, and that time we had the sweet evening light in our favor. This time I was there midday because it took me a good while to find the place due to the weird location of the sign. Actually, I considered this trip a “study” for, hopefully, a revisit later in the day under better lighting conditions, and I used my Olympus SH-1 instead of my Nikon DSLR. First, here’s the original. A nicely composed image of this venerable tree, but what boring light! What could be done? On my way to and from this New England trip I stopped for lunch at the same restaurant. Each time I was seated in a different section, and each of those sections had old oil landscape paintings on the walls in which the colors were not natural but nor were they monochrome. They were sort of a tint. I stared at them and thought there must be a way to recreate this effect in appropriate photographs. Information tucked away in my brain for later use. With a completely open mind I decided to take the image into Nik Color Efex Pro 4 and see what the different presets would do. (Remember my post about letting limitations work for you? My current limitation is that my Topaz plug-ins aren’t saving correctly and so I’m making the best of the Nik Suite.) The first preset I clicked (they’re listed in alphabetical order) was Bi-Color Effects. As you can see from the screenshot, there’s an extensive selection of color combos, and each of those can be tweaked still further. I tried them until I came to Moss 4. That was it. And — not that I was consciously looking for this — it somehow approximates that effect of hovering between not-quite-natural and not-quite-unnatural that I had observed on those oil paintings. Please — let me know what you think! I appreciate your comments. Click here or here if you would like to order a print or other product. Want to go on a photography workshop? You’re in luck — whatever your location, your subject matter of interest, your topic of interest, it’s not difficult to find something to suit your requirements. It’s then a matter of matching up the logistics — the where and when — with what you can afford to pay. I’m enamored with the New England coast. I’m a New England wannabe. Having spent years traveling to and photographing Rhode Island, I discovered the northern Massachusetts and New Hampshire coasts a little over a year ago. New Hampshire can boast of only 18 miles of coastline, but what an amazing variety of visual experiences it offers. How can a visitor from New York make the most of it in a short time? prestigious New England Photography Guild, Jeff lives in the area and knows every inch of the New Hampshire coastline. By wonderful coincidence, Jeff had just put out a notice that he was beginning to offer workshops, and I was just a few weeks away from a week-long visit to the area. Could we arrange a meetup? We sure could. While Jeff organizes workshops around places he thinks would interest people — New Hampshire waterfalls was one recent offering, and he has one coming for (of course) the famous Lupine Festival in Sugar Hill — he will also design one tailor-made to a client’s needs, whether it be a small group or, like me, an individual. My requirements were simple: My time — any time — I spend in this gorgeous region is limited; can you show me a selection of places that would otherwise have taken quite a while to discover on my own, if at all? That’s it — I know how to use my camera, I’m fine with postprocessing, I just want to find the places and, within those places, any special views I should be aware of. Jeff picked me up at my hotel in Seabrook toward late afternoon — he had decided, quite rightly as it turned out, that this would best be done toward sunset — and we worked our way northward. We came upon a lovely little harbor with lobster boats. We also stopped at some picturesque coves that, because of the tall rocks that separate the road from the beach, wouldn’t be visible (and therefore known) to anyone not familiar with the area. And there was Great Island Common, popularly known as New Castle Common, near Portsmouth. Great Island Common offers great views of two lighthouses, Portsmouth Harbor Light and Whaleback Light, the latter of which is actually in Maine waters. But Jeff pointed out two other unique features: the “lone maple tree,” one of the most photographed trees around, and The Seascape Artist, a metal sculpture that you can photograph so as to have it frame the scene and look as if the artist is painting it. The one improvement I could have wished for was totally beyond Jeff’s control: it was a chilly and unbelievably windy evening. Not entirely conducive to getting completely into the meditative zone I need in order to concentrate on getting the best possible images (or to getting tack-sharp images with my 70-300-mm telephoto maxed out). But I think I came away with some good ones. You can judge for yourself by what you see here. If you’re planning a visit to New Hampshire and want to check out workshops, whether preorganized or self-designed, I highly recommend that you contact Jeff Sinon. He knows what he’s about, and in a self-designed workshop such as mine you’ll get exactly what you want — he’s knowledgeable and respects his clients’ wishes. And he’s a master photographer. He has just been chosen to represent New Hampshire in the U.S. edition of Photography’s Traveling Journal. Click here for Jeff’s website. 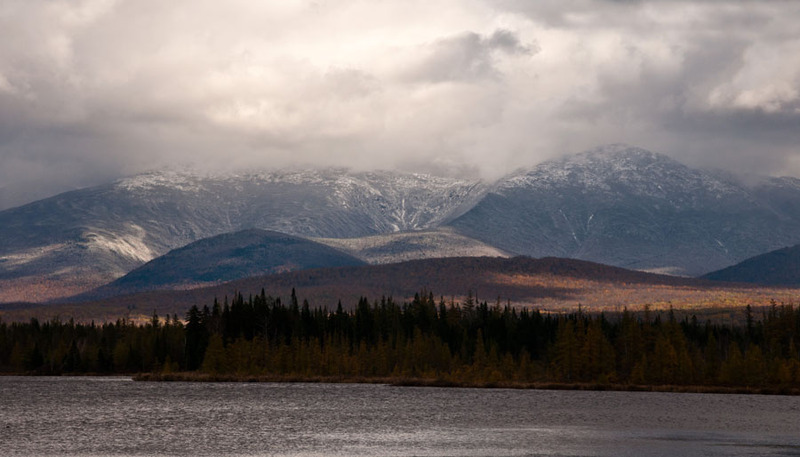 No matter what time of year one visits New Hampshire, those grand mountain landscapes are always an irresistible draw for the camera. Especially (but not only) during foliage season, the scenic vistas along the Kancamagus Highway, Bear Notch Road, and other major routes (think Rt 302 at Bretton Woods) are magnets for photographers of all stripes. A clarification: By “intimate landscape” I mean a scene in which the distance between myself and the closest object is fairly small; I don’t mean macro photography. 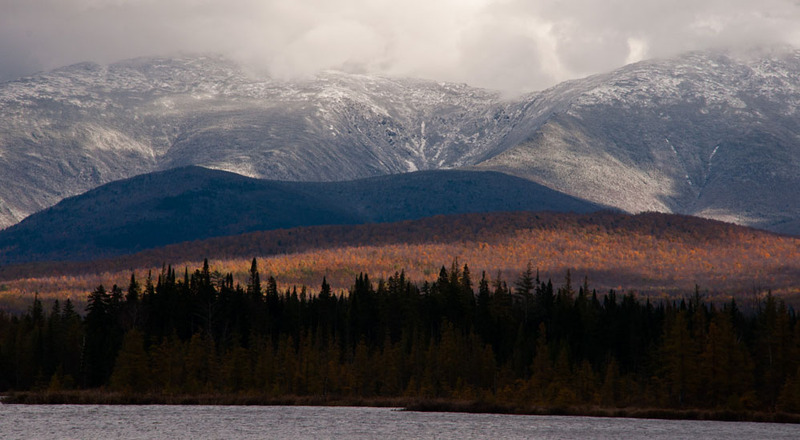 Here are some “intimate landscape” images I made on my recent visit to the White Mountains. Diana’s Bath. I arrived early enough on a rainy day to be able to shoot without other people getting into the images, but the recent drought hadn’t left much water in this multistream waterfall. I aimed in close and vertically so that the waterfall wouldn’t be lost in a series of rocks and played with the exposure to get a silky-but-not-too-silky look. Forest interior. After I made enough images of the actual waterfall, I looked around to see what else might be photo-worthy. Immediately I realized that the scene right before me — the photo to the right — was it. It was as if the tree trunks had bent slightly to let the foliage and the light in the distance be seen. Named for the 19th-century New Hampshire artist Benjamin Champney, this has always been one of the most popular trails along the famed Kancamagus Highway. Not even the fact that the bridge over the stream was destroyed in Hurricane Irene and will not be replaced has changed that. I’ve gotten good forest interiors here before on rainy days, and this time was no exception. When a dry summer has resulted in trees losing leaves rather prematurely, then photograph the leaves on the ground! The varied colors and patterns of those leaves “make” this photo (below), I think. Incidentally, as you can imagine, several of these images required long exposures. It helps that nothing in them was moving, except the water in the waterfalls! This little waterfall has to be one of the best-kept secrets in New Hampshire, as waterfalls go. It’s not listed in any of the guides. Unless you park in the pullover next to it, you’ll hardly notice it; it’s quite hidden by trees. Long exposure needed again. I didn’t want murky shadows, nor did I want to include too much more of the waterfall above where the photo ends; it made for too busy an image. I wonder actually how much water there would have been had I tried this spot two days earlier; as I said above, the drought had depleted the water in all the falls. I had planned to shoot at this spot on the previous day and set out going north on Route 16, but by the time I reached Pinkham Notch the rain was so torrential and thus the visibility so nonexistent that I turned back. Aside from the safety factor, shooting in a bit of rain is one thing, but drowning your DSLR? Not a good idea. I hope you enjoyed these images. I’ll continue with more from this shoot in subsequent posts. If you’d like to see larger versions, or perhaps would like one of these restful scenes decorating your home, click on the images themselves or on this link to my site. Thank you for looking! I’ve just compiled a list of my twelve–that’s right, an even dozen–favorite images that I made during 2012. Can I say they’re by far the best? Well, that’s always very subjective, and a photographer isn’t always the best judge of her/his own work. But IMHO they are certainly among the best, and I’ve chosen them to include representative images from my favorite places and subjects. Here I’m posting a sample for you to see. Click on any of them, or on this link, to go to my website to view this entire gallery of twelve images. The entire gallery–each of the twelve images–is my Print of the Month for January 2013. That means not one but twelve pictures offered for purchase at the special Print of the Month prices. That’s my New Year’s gift to all my friends and followers. May you have a happy, healthy, and prosperous New Year!